If you’ve ever been to a Padres game, chances are you’ve seen Bumble Bee Seafoods’ amazing headquarters in the outfield of Petco Park inside the historical Showley Brothers Candy Factory Building. It might be the coolest location—and building, for that matter—in all of San Diego! Bumble Bee’s new space represents a 180° turnaround from its previous headquarters in Kearny Mesa. 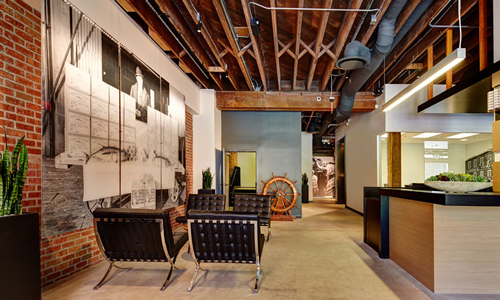 With an open floor plan and lots of amenities throughout, the historical building’s original brick and timber structure has been left exposed with polished concrete walkways to give the space a true “fishing industry” ambiance.